Be the first to share your favorite memory, photo or story of Teodora. This memorial page is dedicated for family, friends and future generations to celebrate the life of their loved one. 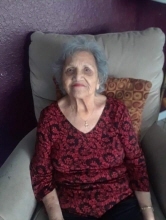 PEORIA - Teodora “Lola” O. Ponce, formally from Peoria, most recently in Bradenton, FL., born July 3, 1929 in Mercedes, Texas, to Porfirio and Guadalupe (Rodriguez) Ortiz; died October 3, 2018 at the age of 89 years and 3 months. She married Jose Guadalupe Ponce on August 18, 1944. He preceded her in death, as did two sons: Esteban Guadalupe Ponce and Ismael Ponce; two brothers, Ismael Ortiz and Ruperto Ortiz; and a sister, Mimi Martinez..
She is survived by eight children: Andres (Lisa) Cervantes of Peoria; Maria (Chuck) Currens of Florida; Eduardo Ponce of Peoria; Ernestina (Artur) Stelmach of Denver, CO; Evangelina (Larry) Albaugh of Monticello, IL; Rogelio Ponce of Peoria; Norma Silvia Ponce of Bradenton, FL; and Ricardo Ponce of Wichita, KS; and she is also survived by 8 siblings. She was a beloved grandmother, great grandmother and great-great grandmother to over 100 children who miss and love her tremendously. At one time she worked for the Illinois Migrant Council, helping migrant workers with food, clothing and schooling issues. She once had a radio program in Peoria in the early 80s called “La Amiga del Aire” and featured all Hispanic music. She was a teachers’ assistant in the Wichita, KS School District for 6 years. She and her husband, Jose, established the Mexican American Society of Peoria, featuring many dances, fiestas, and religious ceremonies of Hispanic cultures. She also worked for the Peoria Urban League for about 5 years. Her most important job was being a mother and raising 10 kids. She could make tortillas faster than anyone, and her rice & beans were heaven. We will miss you, dear mother, but never forget you. She could freeze you with a look, and melt you with a smile. Your remaining children wish you a good journey to heaven. Andrew, Maria, Ed, Tina, Kiki, Roy, Norma, and Richie. A funeral service will be held at 10:00 a.m. on Thursday, October 11, 2018, at Galena Park Baptist Church, 5831 N. Galena Rd., Peoria Heights, IL, with Rev. Larry Johnson officiating. A visitation will be held from 6 to 8 p.m. on Wednesday, October 10, at the mortuary. Burial will follow the service on Thursday at Swan Lake Memory Gardens in Peoria. "Email Address" would like to share the life celebration of Teodora O. Ponce. Click on the "link" to go to share a favorite memory or leave a condolence message for the family.